Laurier’s new chancellor delivered an inspiring message to graduating students at fall convocation: travel the world, experience other cultures, and remain engaged with your alma mater. 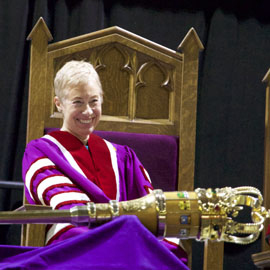 “Go out into the world and use the wonderful talent you have and the knowledge you have gained to make a positive contribution to understanding and peace, but never forget that there is a home for you here,” said Eileen Mercier, who was installed today as Laurier’s ninth chancellor since the university became a public institution in 1973. Over 1,300 graduands were scheduled to convocate at three ceremonies in Waterloo and a fourth at the Brantford campus, between Oct. 27 and Nov. 1. Three Laurier instructors — Jonathan Okun, instructional assistant at the Lazaridis School of Business and Economics; Stephanie Grella, graduate teaching assistant in the Department of Psychology; and Jennifer Long, instructor in the Department of Anthropology — were recognized with Wilfrid Laurier University Awards for Teaching Excellence. And special guests Joe and Stephanie Mancini, founders of The Working Centre in downtown Kitchener, received the prestigious Order of Wilfrid Laurier University. Mercier took the opportunity to stress two key messages to those who graduated: the importance of experiencing the world and the spirit of community — particularly that of Laurier’s community. “Travel to work, to join aid groups, to study and contribute to your deeper understanding of other cultures and histories, so that you might be a force for good in this increasingly complex and difficult world,” she said. Mercier’s installation as chancellor marked a significant homecoming. Among the first women in Canada to build a career in corporate governance, she graduated over 40 years ago with a BA and an academic gold medal from Waterloo Lutheran University, which was later renamed Wilfrid Laurier University. The audience at the Waterloo Memorial Recreation Complex hushed as Laurier’s newest graduates listened to the new chancellor speak of a personal experience 14 years earlier when she lost her husband to cancer. “I was looking for strength and comfort, and miraculously, the [Laurier] Alumni Choir had its beginnings about the same time… I found friendship and support at a time when I needed it most, and reconnected with old friends and made new ones, all because we had the shared experience of having been happy here,” said Mercier. After completing her undergraduate studies in Waterloo, Mercier went on to earn an MA in English from the University of Alberta and an MBA from York University’s Schulich School of Business. Since graduating, she has served on the boards of many corporations and health-care and arts organizations and has received several accolades, including being named one of Canada’s Top 25 Women of Influence. During her speech, Mercier noted that today’s graduates have the benefit of new tools and technology that allows for easier communication with the university family that has influenced some defining years of their lives. “There was no LinkedIn or Facebook when I graduated, and staying in touch with people as they moved around was much more difficult,” said Mercier. “So stay connected, stay involved, whether really or virtually in the life and health of a place that has given you so much.